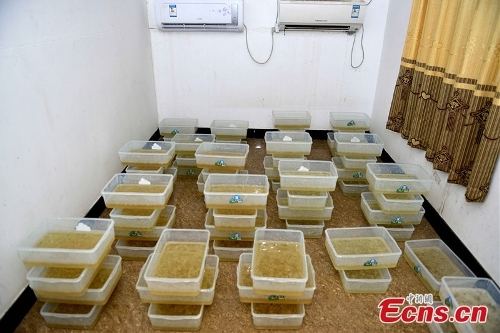 A former village official in South China's Guangdong Province was executed on Thursday for producing and trafficking drugs up to 180 kilograms, a move hailed by the media as a reaffirmation of China's zero-tolerance policy for such crime. Cai Dongjia, former secretary of Communist Party of China (CPC) branch in Boshe village of Lufeng city was sentenced to death in the first ruling in 2016 for making and selling meth, news site thepaper.com reported on Thursday. Apart from the said crimes, Cai, also dubbed the "godfather of meth," used his power as a village official, also a deputy to the Local People's Congress of Shanwei and Lufeng, to protect other drug dealers from the law. The death sentence was delivered by the Intermediate People's Court in Foshan, which also confiscated all his personal belongings, said the report. Cai appealed the first verdict that was upheld by Guangdong Higher People's Court. The Supreme People's Court approved the death sentence. According to China's Criminal Law, persons who smuggle, traffick, transport or manufacture opium of not less than 1,000 grams, heroin or meth of not less than 50 grams or other narcotics in large quantities shall be sentenced to fixed-term imprisonment of 15 years, life in jail or death. Their property shall also be confiscated. The recent death sentence pronounced on Canadian drug smuggler Robert Lloyd Schellenberg for smuggling drugs and participating in organized international drug trafficking has drawn broad support of the Chinese public, who said it showed China's strict policy on drug-related crimes. Those involved in drug-related crimes, be it Chinese or foreigners, will be judged equally by Chinese law, said a professor at the China University of Political Science and Law, requesting anonymity.